Hollywood, over the past few years, has waged war against optimism, relationships and marriage. In seeking to connect with modern/cynical audiences, big-budget cinema seemingly exists to criticize these well-intentioned, life-altering decisions. According to Tinseltown, life post-proposal is nothing but broken promises and empty souls longing for the “till death do us part” scenario to become reality. Following up Gone Girl and Men, Women & Children, White Bird in a Blizzard strives to put the final nail in the coffin. 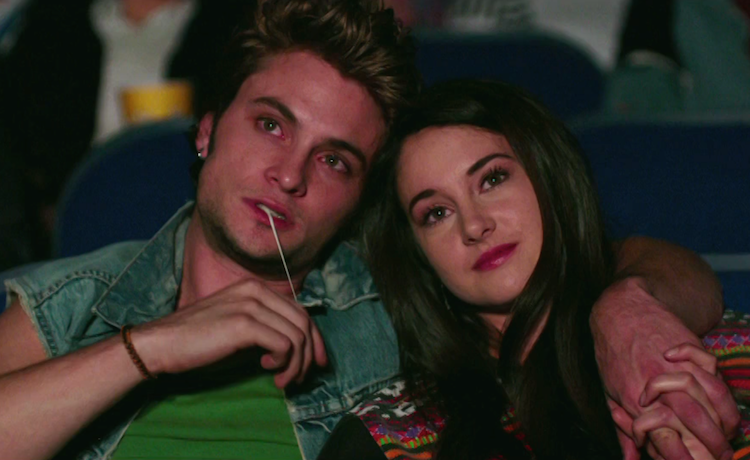 Shailene Woodley & Shiloh Fernandez. In all honesty, despite seeing the positives of marriage, this socially recognised union is not my thing. In fact, White Bird in a Blizzard could spark many wide-ranging viewpoints about marriage, adolescence, and life. The movie, though intent on forming its own analysis, longs for multiple discussions about its story, themes, and characters. Writer/director Gregg Araki (Doom Generation, Mysterious Skin) has studied, and adapted to, this film/film-goer interaction throughout his career. So, does his latest feature stand up to criticism? As it turns out, White Bird in a Blizzard fits comfortably into his controversial filmography. The movie crafts itself around 1980s suburban America’s pros and cons. Its story follows promiscuous high school graduate Kat Connor (Shailene Woodley). Preparing herself for a degree at Berkeley, the youngster – despite her loving family and friends’ support – feels cut off from the rest of the world. Aided by her confident father Brock (Christopher Meloni) and detestable mother Eve (Eva Green), Kat’s life resembles that of your average adolescent. However, after Eve’s mysterious disappearance, Kat must pull herself back from the brink whilst asking the most important question of all: What happened to mum? Christopher Meloni & Eva Green. Based on Laura Kasischke’s best-selling novel, White Bird in a Blizzard takes on several genres and messages within its hurried 91-minute run-time. Exploring out-there stories and characters, Araki’s on-set intentions and off-set demeanour define him as one of American cinema’s most unusual auteur filmmakers. Known for his New Queer Cinema movement entries, he – similarly to Gus Van Sant – isn’t afraid of proclaiming his sexual orientation and significant viewpoints. Faced with fearsome opposition, his movies seek to destroy prejudice, conflict, and status quo. His latest effort, discussing societal norms and the studio system, has a helluva lot on its mind. 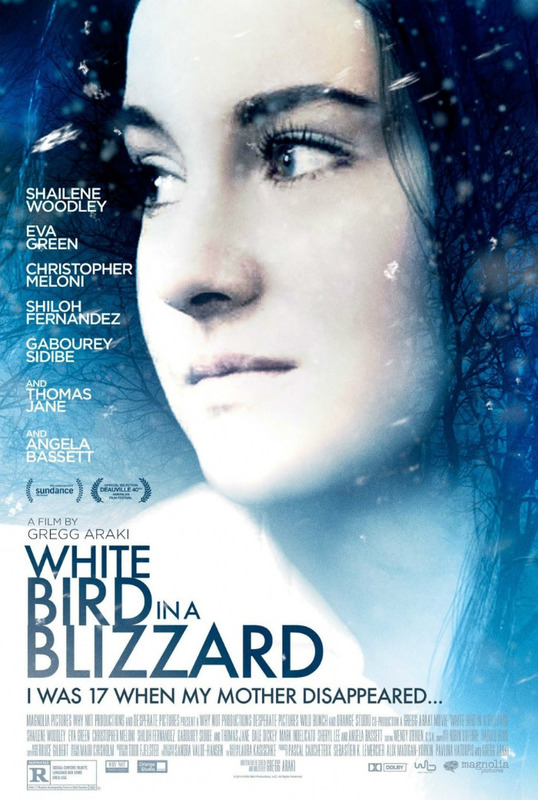 In fact, like previous features, White Bird in a Blizzard depicts horrific events with subtlety, verve, and intelligence. Sticking to Araki’s independent roots, the narrative wears the veil of American Beauty whilst hiding many masochistic undertones. Harking back to Sam Mendes and Todd Solondz’ earlier works, this drama-thriller depicts a love-is-a-lie version of middle-class existence. Tearing his story-threads and characters apart, each sickening twist and turn further enlarge the central conflict’s cracks, tears, and erosion. Kat, pointing out her family and friend’s overt pretentiousness and transparency, becomes the knife slicing through society’s grand illusions. Our existentially frazzled lead, despite her boyfriend/neighbour Phil(Shiloh Fernandez)’s nice-guy nature, seeks primarily to destroy his booming reputation. Several scenes – featuring fluffy conversations between her and friends Beth (Gabourey Sidibe) and Mickey (Mike Indelicato) – strive to elevate our ‘protagonist’ above everyone else. “The beautiful woman she once was…became a phantom wandering away in a snowstorm.” (Kat Connor (Shailene Woodley), White Bird in a Blizzard). Woodley, Gabourey Sidibe & Mark Indelicato. Araki, not one for subtlety or objectivity, designed White Bird in a Blizzard to obliterate suburbia. Despite the approachable set-up, the movie thrusts deep-seeded emotions into the spotlight. Commenting on our evolution from 20th-century patio culture to 21st-century liberalism, the narrative revels in its views on feminism, masculinity, class warfare, gender politics, and relationships. Through flashbacks and dream sequences, we see a nightmarish insight into the Connor household. Eve, close to grinding glass into Brock’s dinner, appears stuck in a mind-numbing and lifeless void. Slipping into a booze-and-loose-clothes-addled depression, she leaps from glorified mistress to independent nightmare. Turning the tide throughout, the movie further examines its own disturbed, philosophical recesses. Biting off more than it can chew, it even tackles current young-adult, mystery-thriller, and relationship-drama trends. Crafting a Lovely Bones-esque switch from marriage to mystery, the narrative pokes fun at its whodunnit twists and turns. Whilst seducing Detective Scieziesciez (Thomas Jane), Kat openly calls her actions into question. Picking apart modern literature heroines’ weaknesses, it’s really an indictment against popular entertainment. She even has two good-looking guys fighting over her, outlined by her roommate’s “I’m Team Oliver” comments. In particular, Woodley’s casting illuminates Divergent and The Fault in Our Stars‘ misgivings. However, her sweet-natured performance, out-classing Meloni and co., highlights her immense dramatic talents. Though Araki’s reach exceeds his grasp, his ambition and style cannot be faulted. Throwing bright colours, comically appealing narration, a kitsch soundtrack, and soap-opera-esque lines across his 11th feature, the writer/director Araki is one of few big-names crafting efforts of lasting effect and whip-smart attitude. White Bird in a Blizzard – thanks to its non-linear structure and self-aware humour – creates a thought-provoking contrast between reality and ‘reel life’. Verdict: A potent and magnetic mystery-thriller.